Boneless turkey breast, about 2-1/2 lb. 1 ea. Shallot, finely minced 1 ea. Tarragon, fresh, chopped 1 Tbsp. Basil, fresh, chopped 1 Tbsp. Cilantro, fresh, chopped 1 Tbsp. Rinse the turkey breast in cold water and pat dry. Carefully, using your fingers, make a pocket between the skin and the breast. Combine the butter, shallots, garlic, lemon zest, lemon juice, orange zest, orange juice, tarragon, parsley, basil, cilantro, salt, and pepper. Mix well. Using a pastry bag, pipe an even layer of the soft butter mixture in the pocket between the skin and the breast. By pressing on the skin, spread herb mixture into an even thin layer throughout the pocket. 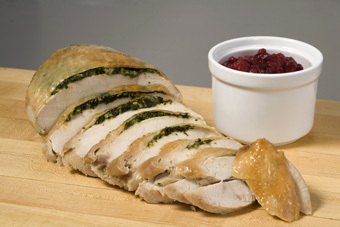 Place turkey breast into a microwave cooking bag, following the instructions for using the microwave bag. Microwave on P7 for 25 minutes, about 8-9 minutes per pound, or internal temperature reached 165ºF. Allow to set 15 minutes before carving. For the chutney, combine all the ingredients in a large microwavable bowl. Cover with plastic wrap, then puncture holes with a small knife, for steam to vent and microwave on P7 for 12 minutes, until slightly thick. Let cool. Keep refrigerated until needed.